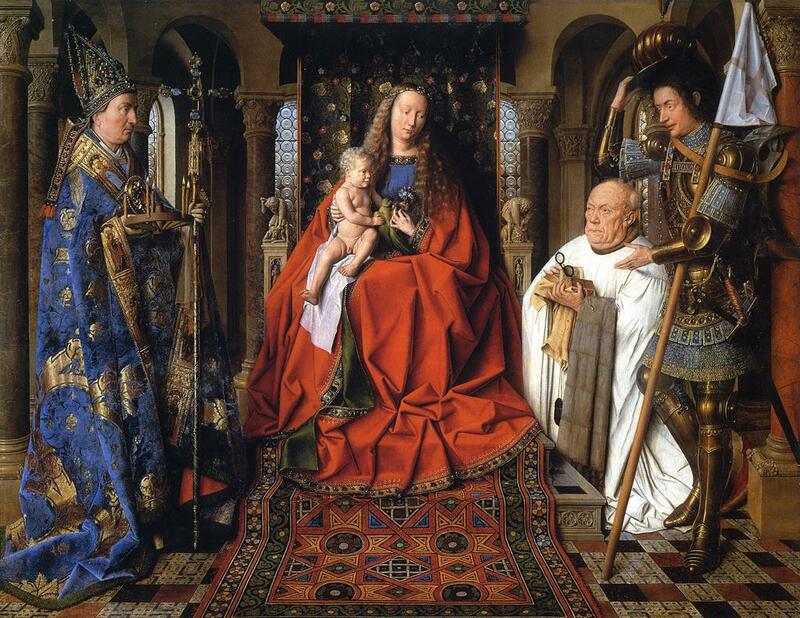 The Madonna and Child with Canon van der Paele depicts a mystic audience between the Virgin, the infant Christ and Jan van der Paele, a pious Bruges patron shown kneeling mid-prayer. The group is joined by the patron saint of Bruges St. Dominik of Reims dressed in blue and by St. George the patron saint of Jan van der Paele. The ensemble resides in a deep arcaded space with colored marble columns and an intricately tiled floor. While not providing light for the figures, there are warped circular glass windows at the back of the scene that hint of an outside garden. Small carvings in the throne and in the column capitals show Biblical scenes foreshadowing the birth and sacrifice of Jesus. 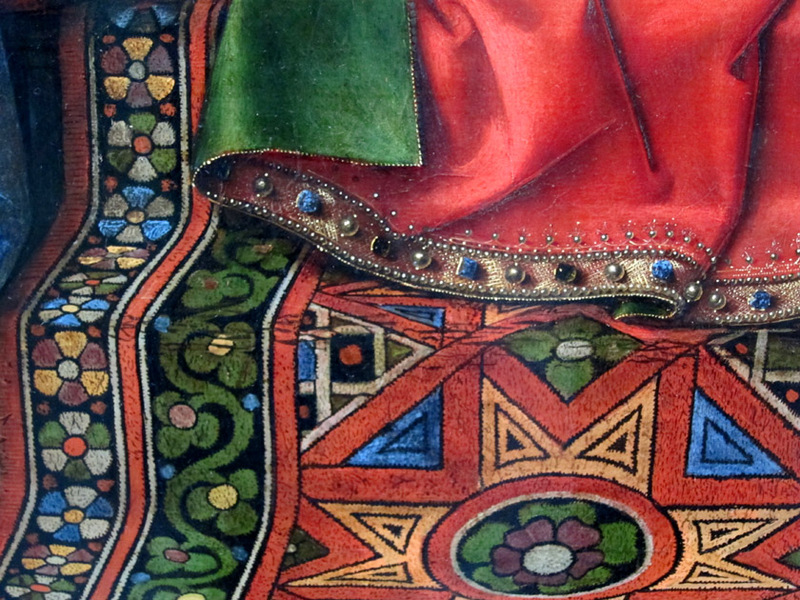 Overall, the painting is executed with an incredible realism, both in its conception of the physical space and in the details of the brocade robes, jewels and armor. While the Madonna and St. George are youthful and elaborately clothed, I was far more drawn to the wrinkled, puffy and sagging face of Canon Peale. 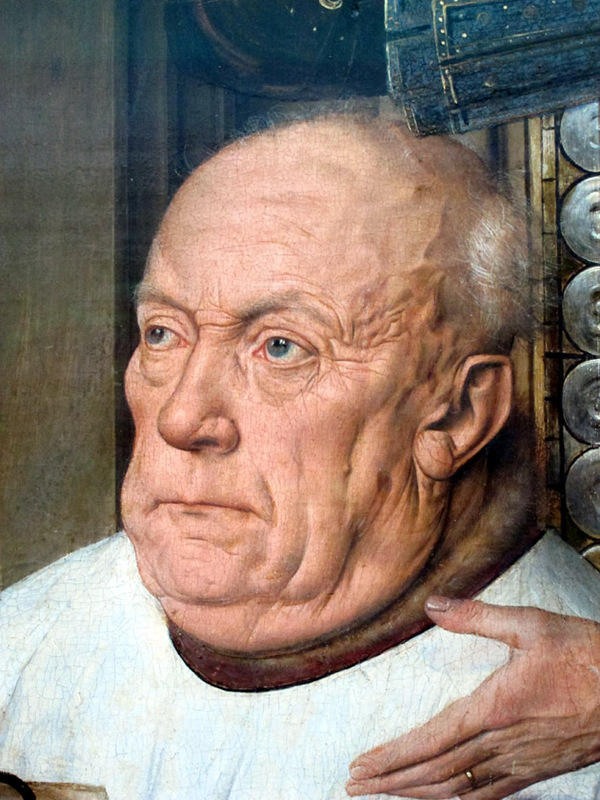 Masterfully executed, you can see all the details of the man’s face without noticing any brushwork. The naturalism is really stunning; my photo doesn’t do it justice. I was also drawn to the brightly colored carpet underneath the throne. The pattern is bold, geometric and vaguely Oriental. This must have been a luxurious detail for contemporary viewers. I love how well the carpet was painted. Rather than just filling in the colored pattern, Van Eyck has taken great care to show the weave of the carpet, how it weighs on itself and even how the surface fibers crack over the edge of the step, thus in every way mimicking a real rug. I think my least favorite parts of the painting were the rather feature-less Madonna and the strange face of the infant. Mary looks more like Eve from Jan van Eyck’s Ghent Altarpiece which is not a flattering portrait. At least off-setting these detractions, the Virgin’s voluminous and heavy robes are beautiful. I also appreciate that the child was posed in a more natural, squirming position. I generally don’t buy a lot of souvenirs when I travel, so in retrospect I missed a good one. The gift shop at the Groeningemuseum actually sold little stuffed green bird toys. What a brilliant gift idea for a baby shower! In the end, I grabbed a reusable shopping bag for 2Euro. It’s not nearly as vivid as the real painting, but then again I put groceries in it. 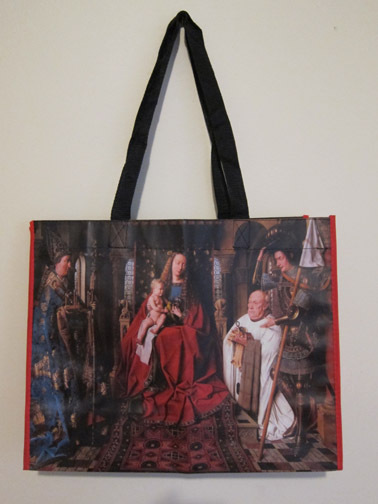 And frankly, I would never get anything done if my shopping bag warranted a few moments of admiration every time I took it out. 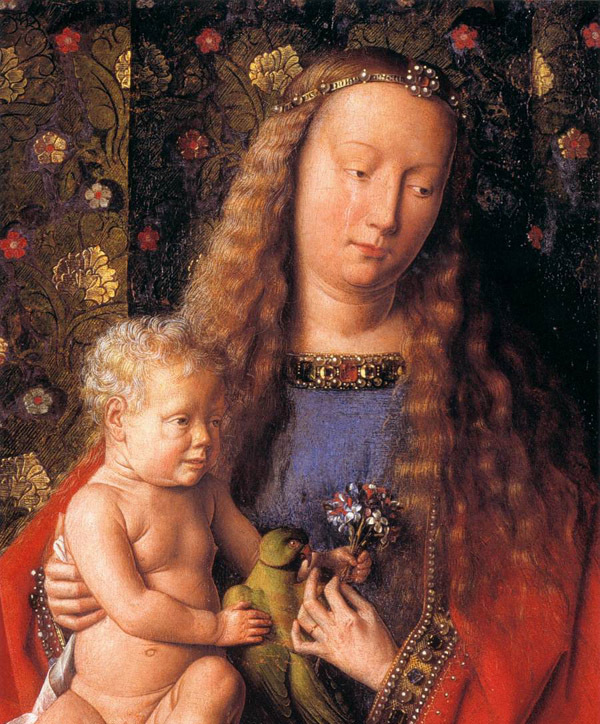 Jan van Eyck’s The Madonna and Child with Canon van der Paele is quite possibly one of the most beautiful paintings I have ever seen. It is inconspicuously hidden in a succinct but powerful gallery and well worth the opportunity to stare inches from the surface at the physical painting or to sit quietly and soak in the radiating effect of the whole. Great write up! 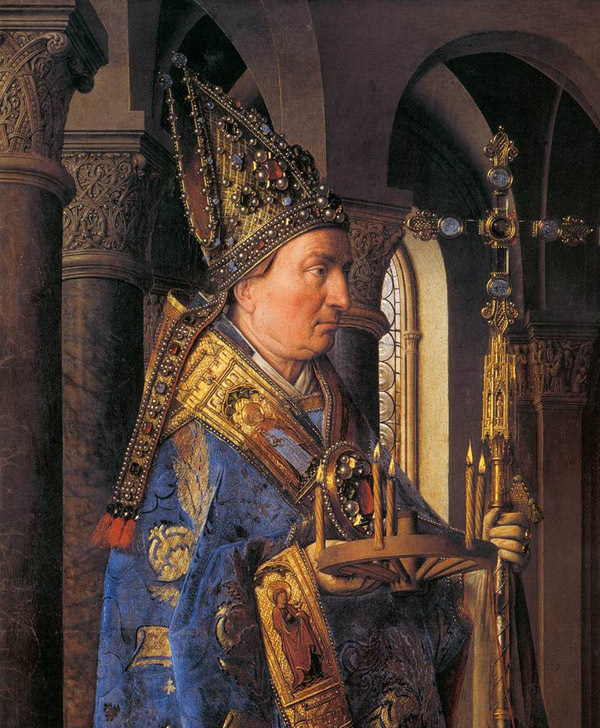 I love Van Eyck, but sadly have never seen any of his paintings in person! I really want to see The Arnolfini Wedding and Man in a Red Turban in the National Gallery of London! I hope you get to the National Gallery soon! I haven’t been myself but want to go too. The Arnolfini Wedding has got to be one of the most famous pieces of art! If you can make it to DC, there is a lovely Jan van Eyck “Annunciation” at the National Gallery. Gorgeous! I love the carpet details! I often get sucked into Dutch still lifes because of all the crazy details. Also, the stuffed green bird souvenir is genius.